If you want to understand the governing principles behind LambdaCube 3D, you should consult the Conceptual Overview. If you just want to see something running right away, we recommend checking out the online editor. If you want to develop a Haskell application using LambdaCube 3D, just read on. LambdaCube is available on Hackage, which should make it easy for Haskell developers to get things rolling. For the purpose of this guide we assume that you already have a working Haskell environment (GHC with cabal-install) set up. 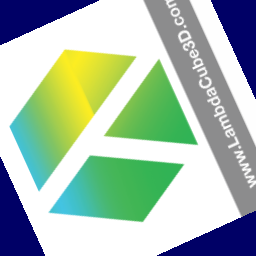 It is best to start by installing the lambdacube-gl package, which provides the Haskell OpenGL backend for LambdaCube 3D. Note that this step also installs lambdacube-ir, which is the core library (IR stands for “intermediate representation”). This library provides the machinery to load compiled pipeline descriptions – a JSON based format – for use in the backend. When developing a LambdaCube 3D application, the recommended way of dealing with *.lc files is to invoke the compiler as an external tool (which would be bundled with the application upon release), and load the resulting JSON pipeline description using the backend API. Let’s have a closer look at the first Hello World variant. Below follows the full source of the example. First we get the imports out of the way. Then we start with the entry point of the program. As a first step, we initialise the window using GLFW. This has to be done before accessing any GPU functionality. Next, we define the shape of the input to the rendering pipeline as required by the backend. The schema is a pure data structure that lists the names and types of primitive streams (defObjectArray) and uniforms (defUniforms) that the pipeline can process. The names and types have to agree with those in the pipeline description (see hello.lc below). For the curious, the schema is a writer monad at heart, and do notation is only used for convenience to easily merge different schema fragments. Given the schema, we create a container that will hold the input to the pipeline at any given time. If we think of the pipeline as a pure function, this is the place that stores the argument for the next application. Now that we have the storage, we can populate it with the pipeline input. We have two triangles that form a square when put together (just to demonstrate the use of multiple meshes), and a texture. Right img <- Juicy.readImage "logo.png"
At this point we can load the pipeline itself. Note that the input data is independent of the pipeline itself, and the two can be freely swapped out separately. Just pipelineDesc <- decodeStrict <$> SB.readFile "hello.json"
All the building blocks are in place, but we still need to connect them. The setStorage function associates the storage with the pipeline and checks that the two are compatible. If there is a schema mismatch, it returns the error message wrapped in Just, otherwise it returns Nothing. In the latter case we are ready to enter the rendering loop. In this example our main loop is directly implemented in the IO monad. First we tell the pipeline the current dimensions of the window so it can configure the viewport. Afterwards, we update the input of the pipeline. In this case only uniforms need to be changed on every frame. Since the texture actually stays the same, we could have set diffuseTexture just once in the beginning before starting the loop. Now that the input is properly set, we can render the frame. This is where we conceptually apply the pipeline function to the currently stored argument. Finally, we check whether Escape is pressed and leave the loop if it is. The only thing left is the final cleanup. After the main function we define the input geometry: two separate triangles. Both meshes have a position and a UV attribute defined for each vertex. At the end we define the window initialising function, which is basically GLFW boilerplate. The hello pipeline starts with a dark blue background, and renders 2D triangle meshes by rotating them around the Z axis and applying a texture. For details on the building blocks of the pipeline you can refer to the Conceptual Overview.